Jeremy Hunt is to urge the EU to stand shoulder to shoulder with the US administration by imposing more comprehensive sanctions against Russia. In his first speech since his appointment as foreign secretary, Hunt will renew the British attack on Russian efforts to undermine liberal democracies, saying Vladimir Putin has made the world “a more dangerous place”, and that after a chemical weapons attack in England, the EU should apply more pressure to protect western democracy from Russian interference and ensure Russia sticks to international rules. 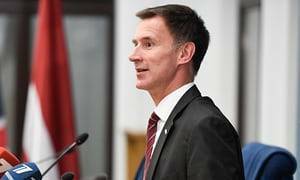 “Today the United Kingdom asks its allies to go further by calling on the European Union to ensure its sanctions against Russia are comprehensive, and that we truly stand shoulder to shoulder with the US,” Hunt will tell an audience in Washington DC. He will also call for new measures to control potential Russian interference in western democratic elections. “Of course we must engage with Moscow, but we must also be blunt: Russia’s foreign policy under President Putin has made the world a more dangerous place,” he will say. Although Donald Trump has adopted an emollient approach to Putin on a personal level, his administration has arguably adopted more comprehensive anti-Russian measures than the EU, imposing not just broad economic sanctions, but also measures against a group of Russian oligarchs close to the Kremlin. Under pressure from Congress, in August the US administration agreed additional sanctions that ban American firms from receiving export licences to sell any equipment to Russia with a national security purpose. Hunt, in Washington for his first round of discussions with US administration officials, including the US secretary of state, Mike Pompeo, told BBC Radio 4’s Today programme that he appreciated that Trump was a controversial president. However, he added that the US had done a huge amount in response to the chemical weapons attack in Salisbury, attributed by Britain to Russian agents. In practice, there is little sign that the EU would agree to impose stronger sanctions against Moscow. The EU agreed in July to roll over for six months wide-ranging economic sanctions against Russia, first adopted in July 2014 after flight MH17 was shot down over Ukraine, killing all 298 people on board. After the Salisbury attacks, the EU recalled its ambassador to Moscow and issued a common declaration that it was “highly likely” Russia was responsible. At least 19 EU member states, including France and Germany, expelled Russian diplomats. But the discussions exposed a familiar fault line in the EU’s dealings with Russia, between those looking for an assertive response and those seeking to maintain existing political and economic ties. Austria, which holds the EU’s rotating presidency, decided not to expel diplomats because it wanted to be a “neutral country”. Italy’s new populist government has pressed for sanctions to be relaxed. The German chancellor, Angela Merkel, met Putin last week and is resisting growing US pressure to cancel the Nordstrom 2 project, a massive new gas pipeline from Russia that will arguably make the EU more dependent on Russian gas supplies. Hunt has insisted that Trump had not been the isolationist president that many people had feared, pointing to the president’s personal engagement with North Korea, and with Putin. “This is someone who does fundamentally believe there should be a rules-based order internationally,” he said. On the future viability of Nato Trump had a point, Hunt said. “It is not in the long run sustainable to have one country in Nato, primarily set up for the defence on Europe, spending 4% of their GDP, and a whole bunch of other countries not even spending 2%. In his speech later on Tuesday, Hunt will also urge the president to agree to new rules to protect the legitimacy of democratic elections, making a specific call for tighter regulation of online political advertising and measures to prevent cyber-attacks on electoral machinery. Hunt will also challenge Trump’s protectionist policies by warning a weakening of free trade will only damage western economies, and ultimately western political power. Any tarnishing of Trump’s electoral mandate is highly perilous territory for a foreign politician, and Hunt will temper his criticism by saying western leaders should not deceive themselves that populism is merely a byproduct of social media spreading fake news. The overall tone of Hunt’s speech is notably more pointed than the style adopted by Boris Johnson. It is likely to be read as an intervention on the side of the anti-Russian faction in the often-feuding US administration, a side that has been slowly recovering ground after Trump was deemed to have misjudged his bilateral, two-hour, one-to-one summit with Putin in Helsinki in July. After the summit, Trump implied that he trusted the Russian president as much if not more than his own intelligence agencies.